Teddy Receives His Canine Good Neighbour Award! Puppy Teddy was surrendered to AireCanada Rescue last January. He was a silly youngster who enjoyed watching TV each evening with Treasurer Jim and who loved attending Doggy Daycare while staying with Webmaster Scott and his wife, Karen. Teddy was a very lucky boy. 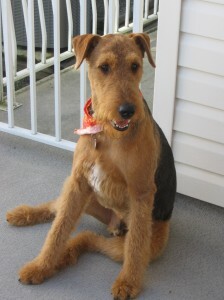 The day he was advertised as being available for adoption, Jen and Ian, already owners of young Airedale Molly, happened to inquire about adopting an Airedale from rescue. We offered Teddy and the rest, as they say, is history. Teddy fell in love with his new Airedale sister, learned to respect the family Border Collie and came quickly to adore all the family members. He was affectionate and minded his manners. Taken for training, he did very well. In fact, Teddy who is barely a year old, has earned his Canine Good Neighbour Badge from the Canadian Kennel Club! AireCanada would like to congratulate Teddy and his owners for this achievement! Here’s hoping you encounter fellow Good Neighbours whether in two or four-legged versions.